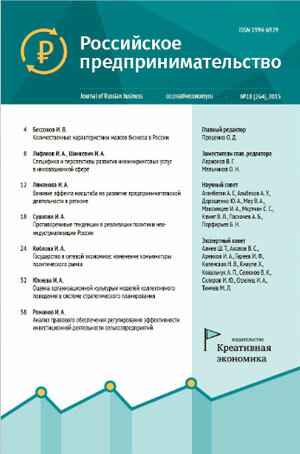 The article discusses the main elements of the mechanism thwarting the development of the contemporary Russian economy. The article characterizes the growth rate of GDP in the BRICS, newly industrialized countries, and MINT. The authors have analyzed the economic development of the countries of North and Central Asia and China. Moreover, the authors have outlined the conditions serving as the foundation for the implementation of structural reforms in Russia. Anatoliy Kosymin, Olyga Kuznetsova (2014). Main determinants of the decline curve of the economic growth in Russia [Osnovnye determinanty krivoy padeniya ekonomicheskogo rosta v Rossii]. Russian Journal of Entrepreneurship, 15(24). (in Russian)..
1. Gogol N.V. Povesti. Dramaticheskie proizvedeniya. – Leningrad, 1983. 2. Grinberg P.S. Osnovnaya prichina krizisa – krakh liberalnogo radikalizma // Zhurnal Novoy ekonomicheskoy assotsiatsii. – 2009. – № 1–2. – S. 115–117. 3. Dostoevskiy F.M. Skvernyy anekdot. Sobranie sochineniy v 15-ti tomakh. T.4. – Leningrad, 1989. 4. Kolesnikov L.F., Kosymin A.D. O mayatnikovyh trendakh gosudarstvennoy aktivnosti v ekonomicheskoy zhizni obschestva // Vestnik ekonomicheskoy integratsii. – 2012. – № 10. – S. 7–24. 5. Kosymin A.D., Metelev S.E., Kosymina E.A. Teoriya i metodologiya poznaniya. – M.: Ekonomika, 2006. 6.Kosymin A.D., Kosymina E.A. Neekonomicheskie grani ekonomiki blagosostoyaniya: sovremennaya problematika. – M.: Ekonomika, 2013. 7. Popov V.V. Ekonomicheskoe chudo perekhodnogo perioda: kak Uzbekistanu udalosy to, chto ne udalosy ni odnoy postsovetskoy ekonomike // Zhurnal Novoy ekonomicheskoy assotsiatsii. – 2014. – № 1. – 136–159. 8. Rossiyskiy statisticheskiy ezhegodnik. 2013. Stat. sbornik. – M.: Rosstat, 2013. 9. Fedorenko N.P. Rossiya uroki proshlogo i liki buduschego. – M.: Ekonomika, 2001.